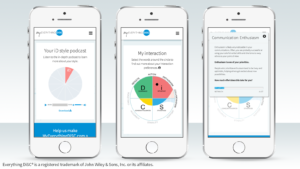 MyEverythingDiSC is a personalized learning experience that allows you to gain deeper insights about DiSC® and the people you know–anytime, from any device. Think about a teammate who seems so much more daring than you. How about a co-worker who is infinitely more patient? While you’re driving for accuracy and stability, what if you were able to see more clearly how and why your boss always seems to be all about collaboration and providing support? Knowing how you are similar and different can help make communicating easier and interpersonal workplace relationships stronger. And the quickest way to access the information you need to make that happen is at MyEverythingDiSC.com. 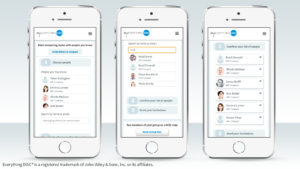 In the interactive My Style section, you can see how your DiSC style impacts your communication and interactions with others. The Effort Meter helps you figure out what kind of interaction, communication, and environmental situations come more naturally, and which ones might require more energy. A powerful supplement to your personalized Everything DiSC report, My Style Podcast is like a 60-minute, one-way coaching session. You’ll gain powerful, and often surprising, insight into your actions, behaviors, and motivations. My Comparisons helps you understand your co-workers—their reactions, motivations, and needs… and be warned, quite often they are not the same as yours. 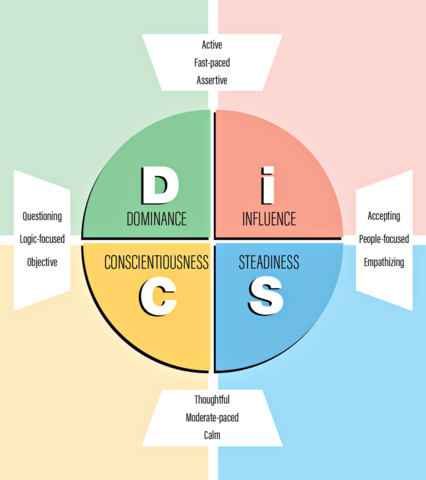 DiSC® is a very simple—and memorable—model made up of four basic styles: D, i, S, and C. This model can be used to establish a common language employees can use to drive better teamwork, collaboration and productivity. What Drives People To Do What They Do? Each of us has our own personality preferences and styles. These differences in preferences and styles shape the relationships in our lives. To a large degree, our individual styles influence who we collaborate well with, and who we tend to have more difficulty with. But the beauty of our preferences and styles is that they are only that…preferences and styles. By becoming familiar with the characteristics associated with the various DiSC® styles, we can begin to understand our co-workers at a deeper level. Make no mistake – this is not about “labeling” people. To the contrary, the goal is to use this knowledge to connect with people more effectively, and to get ahead of potential problems before they become actual problems. When we have a clear understanding of our own preferences and styles – even those things we do that we might not typically notice – we gain power. Power to flex our style when the situation calls for it. Power to understand our strengths and how we can use those strengths to contribute to the success of our teams. Power to know our weaknesses and how to seek the help of others who might be more effective in a particular area. 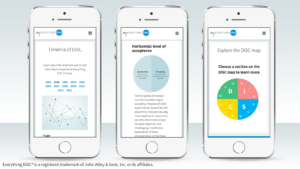 Everything DiSC® Isn’t The Only Personality Styles Tool… It’s Just The Best! Easy To Remember. A key factor in the global adoption of DiSC® is its simplicity. Unlike other instruments – which often require people to memorize a string of letters or learn how to decipher what a color means – DiSC is easy to remember. Each letter stands for a particular style (Dominance, Influence, Steadiness or Conscientiousness), and each style is a commonly understood word that encapsulates the core preference associated with the style. At the end of the day, if your people don’t remember the model, the underlying value associated with the science behind it will be lost. Validated and Trusted. At the end of the day, the participant has to agree with his or her results. And while most assessments in our industry are just tested for internal reliability, Everything DiSC takes it a few steps further. By looking at things like test-retest (the stability of the tool), correlations with other respected instruments, correlations with outside observer ratings, and correlations with actual work behavior, Everything DiSC assessments have been validated to ensure that participants get the most accurate results possible. Easy To Facilitate. The Everything DiSC assessments are scored online. And debriefing the results does not require the facilitator to go through a lengthy certification process. DiSC is designed to be as usable and accessible as possible. Everything DiSC has already proven to be a great tool in our team goals of enhancing communication, connectedness and trust.